Sonic the Hedgehog performing a Spin Dash in Super Smash Bros. Brawl. The Spin Dash, which debuted as the Super Dash Attack in Sonic the Hedgehog 2 (16-bit) and the Super Spin Dash in Sonic the Hedgehog CD (and is called a Turbo in Sonic the Comic), is the ability of Sonic and various other playable characters to dash off from a standstill. Its animation is meant to symbolize the wheel of a car during a burnout. The character crouches, curls into a ball, spins to rev up and gain potential energy, and finally takes off at great speed. As at any other time the character is in a ball, if they hit an enemy (e.g. a badnik or Dr. Eggman) they deal damage to them. The Spin Dash is faster and can be more useful than the spin roll. While Sonic CD featured the first move named Spin Dash, the most famous move by this name debuted in Sonic 2 and has appeared in most Sonic games released since. In 2D side-scrolling games the move is performed by holding and pressing a jump button. Most 3D titles have the spin dash assigned to a single button. Knuckles the Echidna about to demonstrate the technique on a helpless Sparkle in Sonic 3's Carnival Night Zone. The most famous form of the Spin Dash debuted in Sonic 2 as the Super Dash Attack, works almost identically in Sonic 3 and Sonic & Knuckles in which it is called the Spin Dash Attack, and is usable in all subsequent 2D games. Holding and pressing Jump ( , or ) will charge up a Spin Dash; releasing will send the character zooming forwards at high speed. By repeatedly tapping the button, the launch speed increases. In Tails Adventures, Tails can perform this move if he finds the Sonic item in Caron Forest and brings it with him on adventures. The Sonic 2 version of the Spin Dash has been retroactively added to the original Sonic the Hedgehog game four times officially (and many times by fans through ROM hacking; see below). In Sonic Jam: When Sonic the Hedgehog 1 was ported to the Sega Saturn as part of the Sonic games compilation Sonic Jam, the move was added as an optional feature. The move can allow the player to finish levels much more quickly, but creates a potential problem in Green Hill Zone by slightly increasing the chance of triggering the S-tunnel scrolling bug, in which the screen does not scroll quickly enough to keep up with Sonic and he dies on hitting its bottom (as if it were a pit). In Sonic the Hedgehog Genesis: The Spin Dash is also present in Sonic the Hedgehog Genesis, a recreation of the original game on the Nintendo Game Boy Advance. It works much as it usually does, with the exception that while charging speed, Sonic remains vulnerable to damage. In Sonic the Hedgehog (2013): The Spin Dash is also present in Sonic the Hedgehog (2013), a remaster of the original game on iOS and Android devices. It works much as it usually does, however it may not always be useful as the stages are not built for it. In 3D Sonic the Hedgehog: The Spin Dash is present in 3D Sonic the Hedgehog. It can be toggled off and on (which requires a game reset), and is on by default. For some reason, Sonic can still be damaged by collision with a moving Badnik while charging the move in this version, much like Sonic the Hedgehog Genesis. In Sega Ages: Sonic the Hedgehog: The Spin Dash is present in Sega Ages: Sonic the Hedgehog where it can be toggled off and on alongside the Drop Dash (which requires a game reset), and is on by default. Its coding is the same as in 3D Sonic the Hedgehog, so Sonic can still be damaged by collision while charging the move. In both Challenge modes, the Spin Dash is always enabled. Sonic the Hedgehog CD was released after Sonic 2, and so technically marks the move's second appearance (as the Super Spin Dash), but here it functions differently to the version in the latter game and subsequent 2D titles. Revving up does not confer invulnerability to attack, and must be completed by holding Jump for a sufficient time, otherwise Sonic will just stand up instead of dashing off--which, in any case, he always does at the same speed, because the launch speed is not scalable. In the 2011 remaster, the player is given the option to choose between this type of spin dash and the Sonic 2 version. In 3D Sonic games, the first of which was Sonic 3D Blast, the Spin Dash is performed by pressing a single dedicated button (usually from a standstill as in the 2D games) rather than using and Jump, because the directional controls are used to move Sonic around the floor. In Sonic Lost World, it is possible for Sonic to dash forward continuously from a Spin Dash by pressing and holding the button immediately after releasing the move. He can also perform the Spin Dash while running on walls or ceilings for an extra boost. In Super Smash Bros. Brawl, Super Smash Bros. for Nintendo 3DS / Wii U and Super Smash Bros. 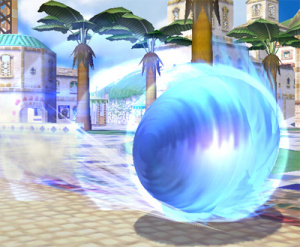 Ultimate, Sonic performs a Spin Dash for his side special move. The move is charged by holding + , then launched by releasing the buttons, causing Sonic to make a short hop as he dashes. The Spin Dash is also his down special move, but this variation is called the Spin Charge, and is charged by holding and repeatedly pressing , much like in traditional Sonic games, and does not make Sonic do a small hop. Custom Side Special 1: Hammer Spin Dash. Has a larger hop at the beginning, with the descending part of the arc having burying capabilities. Custom Side Special 2: Burning Spin Dash. The hop is non-existent, but Sonic is on fire. Has shorter hops out of the move. Custom Down Special 1: Auto-Spin Charge. Removes the need to repeatedly press the button in order to charge. Custom Down Special 2: Gravitational Charge. Pulls opponents in front of Sonic towards him, and pushes opponents behind Sonic away from him. Esrael ported its code from the famous Sonic 2 beta. drx wrote his own code. Hivebrain ported its code from Sonic the Hedgehog 2 final, as part of his hack Sonic the Hedgehog Plus. Stealth ported the move (along with the entire Knuckles the Echidna object) from Knuckles in Sonic 2, as part of his hack Knuckles the Echidna in Sonic the Hedgehog. This implementation was also included in Sonic the Hedgehog Megamix. Cinossu wrote his own code, in the style of Sonic CD, for his hack Sonic the Hedgehog Extended Edition. Other hacks have implemented the Sonic CD Spin Dash, albeit much less frequently. qiuu and snkenjoi replaced Sonic CD's version of the move with that of Sonic 2 in their hack Sonic CD Plus Plus, in response to a bounty by Mad Echidna. This was well-received by many members. Nowadays, due to widespread assembly language usage and the existence of a Spin Dash porting guide, most recent Sonic 1 hacks feature a Spin Dash, usually Sonic 2-style. This page was last edited on 31 March 2019, at 16:27.